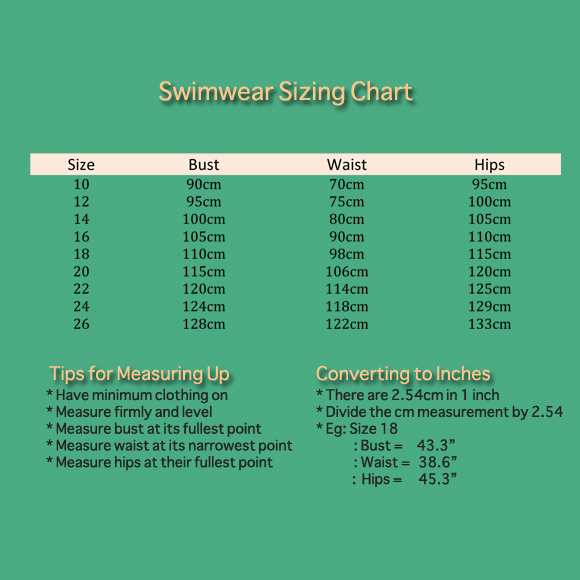 Capriosca Swimwear Sizing . : Sequins and Sand Resort Wear :. We stock Australia's Capriosca Swimwear because we think it's stylish, thoughtfully crafted and great value. One thing we'd like to say is that we've found Capriosca's sizing to be fairly 'true' so if you are a 14 in most swimwear labels, you are most likely to be a 14 in Capriosca. Capriosca Swimwear has styles in sizes up to a 26 so look for them! The image to the right of screen is of a Sizing Chart. You can enlarge it by clicking on it to reveal what your size is after you measure yourself. There are useful tips on How To Measure to get the most accurate result. Remember, these measurements are a guide and that you may fall 'in between'. Then, as with anything you try on, you will need to decide which direction to go...up a size or down a size and that is a personal thing. Swimwear is usually a firmer fit but you may not like that feeling...it's up to you. Remember too that size is one thing, but fit is just as important. Fit is about finding a style to suit your shape so that you look AND fell your best. There are Fit Tips for every swimsuit in our range on its product page so look out for them. If you're still unsure about the right size for you, please don't hesitate to send us an email to and we'll sort it out together, for sure. Experts in 'Beach to Bar' dressing Sequins & Sand is dedicated to helping busy women 35+ look and feel fabulous on the beach and beyond. Our focus, Resort wear. Kaftans, beach wear, swimwear, sarongs, hats, beach bags are always on our mind, always in store. Shop The Shop now and start to live your best summer!